Tactical Sht has become the exclusive dealer of Rhino Arms Barrels in the entire country. Tactical Sht, a tactical gear and accessories distributor in St. Charles, Missouri, has officially become the exclusive distributor of Rhino Arms Match Barrels for the entire country. This is a part of Tactical Sht's latest efforts to bring gun enthusiasts everywhere the very best in tactical equipment and gun parts. Due to this recent agreement between Tactical Sht and Rhino Arms, Tactical Sht is the only place in the entire country that you can purchase a high-end Rhino Arms Bull Barrel without purchasing an entire rifle with the barrel already on it. 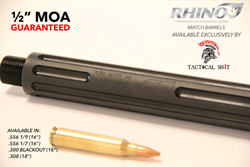 Rhino Arms Bull Barrels give you guaranteed 1/2 MOA at 100 yards, are Melonite coated, and have single sided polygonal rifling. These are great for competition shooting, long range accuracy, and 3 Gun competitions. Tactical Sht offers these Rhino Arms Barrels in several different sizes including 5.56 16", 300 Blackout 16", and .308 18" along with giving you the option to have the barrel standard, fluted, or dimpled. As a company who is passionate about providing products that their customers desire, Tactical Sht is excited to increase their distributor reach and range of tactical products. They will continue to provide dynamic product lines for customers and expand their dealer program. To become a dealer of Tactical Sht click here.